A powerful, sobering documentary on the images of 9/11 that proved too disturbing for Americans to witness after their release the next day, which from then on have been largely withheld from public view. 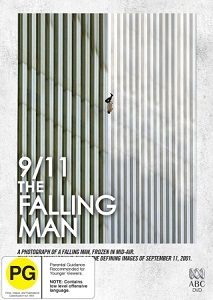 9/11: The Falling Man is an historical must-see. “It must have felt like flying” is the wishful utterance of a husband of one of the victims from the Twin Towers as he tried to come to grips with the discovery that she may have plunged to her death that fateful day instead of succumbing to smoke inhalation or worse, the unspeakable, being burned alive. These exercises in mental torture are just a glimpse of the anguish shared by thousands then and now, since the most singularly horrific day in modern American history. And in the unflinching 2006 documentary 9/11: The Falling Man, the curtain is pulled away on the part of the story we all know is true but has remained in the shadows: the jumpers. Clear evidence supports the scenario that upwards of 200 people were so desperate to escape the smoke and flames that they actually flung themselves out of windows over 100 stories high, knowing full well how their descent would end. We’ve seen and heard anecdotal witness accounts of the event but actual images or video have all but disappeared from the public purview. The most notable among them was one image taken by Richard Drew, an Associated Press photographer who happened to be downtown to cover New York Fashion Week. When he exited the subway on Chambers Street in Lower Manhattan, he found himself witness to a man falling from the North Tower, so his professional instincts took over and he started shooting. Drew made his way back to the AP offices at Rockefeller Center and together with the editorial staff, selected one image which showed the man in perfect vertical alignment to both towers, an image at once so awful yet graceful in its depiction of humanity, made more poignant by the knowledge of what was to come. The image was released and the next day it ran in The New York Times. Other papers throughout the country also ran the photo, but nowhere was it as enlarged as the full page layout it received in The Morning Call, a local paper in Allentown, PA. Angry letters and messages flooded in, with many accusing the paper of insensitively exploiting the tragedy. Indeed the overall reaction throughout the country was so negative that the photo never appeared again, and was considered too inflammatory for general consumption. Enter Tom Junod, a writer working on a 9/11 story for Esquire Magazine in 2003, who couldn’t get the image out of his head and decided to make it the centerpiece of a feature article, dubbing the victim “The Falling Man”. Thus began an investigation into the identity of this person, who it was widely assumed was a worker at Windows on the World, the iconic restaurant perched on the top floors (106/107) of the North Tower. This film tells the story of the ins and outs of the forensic investigation, with a few theories surfacing about likely id’s on Falling Man. More powerfully, the film deals with the moral conundrums faced by Junod, Richard Drew, investigators, editorial journalists, and survivors themselves, especially in dealing with grief-stricken families whose personal and religious beliefs were rocked to the core by the possibility that their loved one may have taken this desperate action. Director, Henry Singer was perplexed (as was Tom Junod) about why the American media packaging of the 9/11 tragedy was almost solely focused on the heroic actions of the first responders, followed by the workers on ‘the heap’ (as the site came to be called). It was as if we needed the more positive human interest spin on the event rather than an (admittedly) shattering account of the true scenes of horror which unfolded before our eyes but that we’d prefer to bury in our collective subconscious. One could say it was too much too soon. But if so, then when? The significance of a film such as 9/11: The Falling Man – as much as it stands as an unflinching reminder of the horror inflicted upon us that fateful day – extends to the larger conversation we’re having right now about History itself. We are suffering, it seems, from a collective impulse toward a bizarre kind of Revisionism, one that excuses our impulse to rewrite history in order to make our Past sync up squarely with the moral and ethical tenets of our Present. From tearing down historical statues to excising entire careers from the public record because someone’s personal actions are discovered to be morally deplorable by today’s standards, this sanitizing of our past does nothing to educate us as a society or prevent us from repeating the sins of our fathers. In the case of The Falling Man and all the rest who found themselves in the most impossible position imaginable that day, the film is telling us that – perhaps – at the end they seized the only control they could over their own final moment on Earth.